Following hard on the heels of the Berliner Philharmoniker Sibelius Edition chief conductor Sir Simon Rattle has turned his attention to the complete Beethoven symphonies. In addition to these Berlin performances the orchestra toured with the Beethoven cycle performing in Paris, Vienna and New York and receiving a warm welcome. Commenced in 1800, Beethoven’s epic cycle of nine symphonies is revered as one of the greatest legacies to music culture with each symphony inhabiting its own individual world. Daniel Barenboim explained “It’s one of the greatest adventures in music that we play the same pieces again and again – and that, despite their constant repetition, they sound different every time.” I have a number of complete Beethoven cycles of the symphonies and also hear individual symphonies in concert performance and remain astonished at the number of new things there are to hear. In an interview for this release Rattle said of performing Beethoven with the Berliner Philharmoniker “You can make Beethoven too sophisticated or too elegant, you can clean him up too much. You can try to make him agree with himself when often he’s fighting with himself. I have the feeling probably that the more plain-spoken this music is, the better it is.” Rattle uses the Beethoven scores in the Urtext edited by Jonathan Del Mar published by Bärenreiter in 1996/2000. Incidentally this is the same edition that the Berliner Philharmoniker used with Claudio Abbado for the recording of his 2000 cycle on Deutsche Grammophon. The Berlin players get off to a flying start with the often overlooked Symphony No. 1 the shortest in length. Completed in 1800 the score bears a dedication to Baron Gottfried van Swieten, Beethoven’s early patron. The symphony was premièred in 1800 at Hofburgtheater, Vienna and it is thought that the composer himself may have conducted. Immediately noticeable is the freshness and lightness of touch of the playing. The brisk and spirited opening Allegro establishes an exhilarating mood contrasting with the rustic character of the graciously played Andante. It’s rare to hear such detail in the winds; a quality that applies across the complete cycle: testimony to the excellence of the sound engineers. Mainly composed in 1802 during Beethoven’s stay at Heiligenstadt, the Symphony No. 2 is dedicated to benefactor Prince Karl Alois Lichnowsky. Beethoven premièred the work the following year at Theater an der Wien. A product of the time of Beethoven’s harrowing emotional turmoil as demonstrated by the so-called Heiligenstadt Testament, a dark, serious mood permeates primarily the determined opening movement. By contrast the Finale is joyous and uplifting, repeatedly swirling round and around and concluding on a rather festive note. A frequently heard work in the concert hall it is well known that Beethoven originally dedicated his Symphony No. 3 to Napoleon Bonaparte before tearing up the relevant page and replacing it with the title Eroica. Completed in 1804 it was the next year before Beethoven introduced the score publicly at Theater an der Wien. Rattle fully appreciates that this progressive score is music of considerable concentration and, as the designation might suggest, heroic power. Thrilling and invigorating the Berlin players in the opening Allegro con brio convey a sense of defiance in the face of adversity. Underpinned by the rich and deep low strings the solemn tread given to the renowned Marche funèbre is unerring. Written in the summer of 1806 the Symphony No. 4 is dedicated to Count Franz von Oppersdorff a Silesian nobleman who commissioned the work. Beethoven actually stopped work on the Fifth Symphony to compose this B flat major score. It was the following year before Beethoven conducted the work before the public at a Liebhaber-Concert at University of Vienna. Opening with an Adagio the mood easily evokes a dark prison scene from an opera. This is followed by an Allegro Vivace section radiating an uplifting celebratory feel. Delightfully lyrical the Adagio movement is full of sensitive playing - all disarming calm and contentment. After a long gestation the Symphony No. 5 was completed in 1808. Dedications to both Prince Lobkowitz and Count Rasumovsky appear on the printed score. Beethoven himself introduced the symphony the same year as that of its completion at Theater an der Wien. Most of these Berlin players must have performed this enduringly popular symphony countless times yet their reading sounds newly minted. Marked Allegro con brio in the bold opening movement Rattle creates a dark, serious tone. His is a powerful performance of inspiring intensity. One of my favourite movements in all Beethoven’s symphonies is the Andante con moto where Rattle fashions an oasis of calm that suggests to me a magnificent Tyrolean setting yet reveals a slight undertow of sorrow. No conductor has equalled on record the same level of spine-tingling intensity that Karajan and his Berlin players bring to the Andante con moto in their 1962 Jesus-Christus-Kirche, Berlin account on Deutsche Grammophon. Beethoven rarely journeyed into programme music but with his Symphony No. 6 ‘Pastoral’ he created one of the greatest examples ever. Also completed in 1808 this score of Beethoven’s “expressions of feelings” suggesting a walk through rustic scenes is constructed in five movements. Also dedicated to Prince Lobkowitz and Count Rasumovsky it is thought that Beethoven that same year conducted its première, once again, at Theater an der Wien. In this much loved work Rattle gives a convincing reading of real penetration. Especially impressive is the opening movement an ‘Awakening of cheerful feelings upon arrival in the country’ with beautiful playing that agreeably paints a vivid nature scene. The uplifting Scherzo — a ‘Happy gathering of country folk’ is admirable with impressively sprung rhythms evoking rustic dancing and merriment. It's redolent of a scene from a Pieter Bruegel painting. The playing of the short ‘Storm’ movement is remarakable. It’s easy to imagine villagers running for shelter from the downpour, lightning bolts and thunderclaps. Both the Symphony No. 7 and Symphony No. 8 were completed in 1812 yet they differ widely. Dedicated to Count Moritz von Fries the Seventh Symphony enjoyed great success at its 1813 première at Vienna University. It was Wagner who famously described the symphony as the “apotheosis of the dance”. In these assured hands the passionate music of the extended opening Poco sostenuto - Vivace, feels like the overture to an unwritten opera. It is irresistibly played. Striking is the austere beauty of the much admired Allegretto, possibly a homage to those soldiers who had recently died fighting the French invaders. The sense of vivacity and joy that Rattle achieves in the Scherzo is uplifting and the inspiring Finale is played with an infectious exuberance. I have yet to hear a performance of the Finale to equal the intensity that Wilhelm Furtwängler and the Berliner Philharmoniker gave to their live recording from October/November 1943 at the (alte) Philharmonie, Berlin. With the second duration in this cycle Beethoven warmly described the Symphony No. 8 as “My little Symphony in F”. There was no dedication to the Eighth Symphony, a work overshadowed by the immense dimensions of the Seventh and the Ninth. Beethoven introduced the score to the public in 1814 at the Redoutensaal, Vienna. Without forfeiting precision there is a strong sense of spontaneity to Rattle’s interpretation. Powerfully played, the opening Allegro vivace e con brio is proud and resolute. Gloriously melodic in the Allegretto scherzando Rattle ensures wonderfully sprung rhythms and an expression that evokes the scene of a toy shop. The Berlin players rise to the challenges of the festive and good humoured Finale: Allegro vivace. This movement's seemingly unlimited and sudden variations of rhythm and tempi are matched by a capacious imagination. Dedicated to King Friedrich Wilhelm III of Prussia the colossal Symphony No. 9 ‘Choral’ is one of the most magnificent and memorable works in the entire classical repertoire. Composed in 1822/24 the score is unusual in its massive choral Finale - a setting of Friedrich Schiller’s poem ‘Ode to Joy’. It can be hard to comprehend that by the time of its première in 1824 at Kärntnertortheater, Vienna, Beethoven, who assisted conductor Michael Umlauf with the performance, was profoundly deaf. Rattle’s decisive forward momentum in the opening movement is striking as is the tightening of tension to produce a sense of torment and anger. In the great Scherzo this determined reading is searingly powerful and the beautiful melancholic slow movement must surely be a love letter in music communicating the pain of parting. Notable in the Presto the eight sonorous double basses establish a rock-solid foundation for the Finale. With its famous choral setting of ‘Ode to Joy’ this is the crowning glory of the score. Resolutely controlled climaxes and the sensation of dark menace produced from the low strings send a shiver down the spine. In the choral section, excellent rich-toned bass Dimitry Ivashchenko is highly secure and the nicely contrasted voices of Annette Dasch (soprano), Eva Vogel (mezzo-soprano) and Christian Elsner (tenor) sound quite magnificent. Tightly drilled by chorus master Simon Halsey the outstanding Rundfunkchor Berlin performs with unison and focus; marvellously expressive in the dramatic moments. Rattle doesn’t overload the weight of the playing, astutely holding back the fury thus avoiding a possibly uncomfortable cacophony. For those looking for an ultra-powerful ‘Choral’ Symphony the standout account is from Furtwängler and the Berliner Philharmoniker - a legendary recording from March 1942 in the (alte) Philharmonie, Berlin. Furtwängler achieves an incredible level of sheer ferocity in the propulsive climaxes and an unyielding sense of torment and anger. Furtwängler’s quartet of soloists is Tilla Briem (soprano); Elisabeth Höngen (mezzo); Peter Anders (tenor) and Rudolf Watzke (bass) with the Bruno Kittel Choir. Furtwängler’s account has the advantage of surprisingly good sound for its age and I would commend recordings on the labels Société Wilhelm Furtwängler and, best of all, the version on Pristine Audio. With such an outstanding choice it can become difficult to settle on one specific set. There are a few conductors who have recorded more than one cycle with Karajan having four. The complete sets that I most admire are from the Berliner Philharmoniker/Claudio Abbado/Deutsche Grammophon; Berliner Philharmoniker/Herbert von Karajan/Deutsche Grammophon (1961/62); Wiener Philharmoniker/Sir Simon Rattle/EMI; Berliner Philharmoniker/André Cluytens/EMI and Symphonieorchester des Bayerischen Rundfunks/Mariss Jansons on BR-Klassik. This inspiring Berlin cycle from Rattle in 2015 surpasses the above sets and is definitely the one to have. My principal impressions are of the elevated level of musical intelligence and structural coherence of the interpretations that Rattle obtains from his players. Powerfully convincing these performances feel fresh and buoyantly rhythmic with plenty of impetus when required. Striking is the penetrating degree of lyricism and the level of intensity brought to Beethoven’s music. I wrote similar comments about a recent cycle by Mariss Jansons and the Symphonieorchester des Bayerischen Rundfunks recorded in 2013 on BR-Klassik, nevertheless by comparison Rattle’s performances feel more supple, less weighty yet responsive and providing remarkable impact. Notable throughout is the stunning woodwind playing and the glorious sound of the Berlin brass section, conspicuous for its pleasing and consistent intonation. The unity and range of the strings is remarkable especially the rich timbre of the cellos and basses so vital for ensuring a rock-steady foundation. No problems whatsoever with the sound quality of the CDs, pure audio Blu-ray disc and live concert videos. The crystal clear sound, natural presence and excellent balance come complete with a level of remarkable detail rarely heard on recordings. No audience applause has been left in the audio recordings. I haven’t downloaded any of the high resolution audio files. Filming concerts regularly at the Philharmonie the video director and production engineers are skilled at their work. Not surprisingly the HD picture quality of the concert videos is entirely satisfying with a wide array of telling shots including sensible and appropriate close-ups. 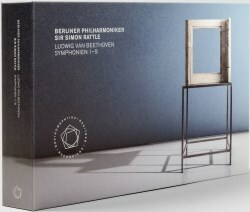 Some 94 minutes in total, the substantial bonus material of the second video disc, the documentary ‘Living with Beethoven’ and ‘Sir Simon Rattle talks about Beethoven Symphonies’ are certainly well worth watching, full of helpful information and fascinating insights into the performance process behind Rattle’s interpretations. The 74 page booklet in German and English contains a wealth of information including an essay ‘A cosmos of its own’ concerning the history of performing the symphonies in Beethoven’s time by Jan Caeyers and ‘Never just one source’ an explanation of the methodology behind Jonathan Del Mar’s edition of the symphonies. Considerately the ‘Choral’ Symphony sung texts and translations are provided. This is high-end merchandise presented as lavishly I have come to expect from this source but more importantly the quality of the performances and recorded sound is to an elevated standard. This cycle should become a classic.